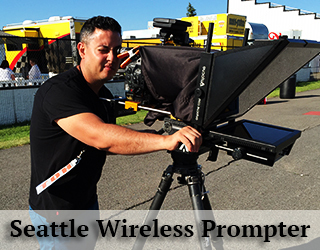 We have the following prompter gear available in this city. 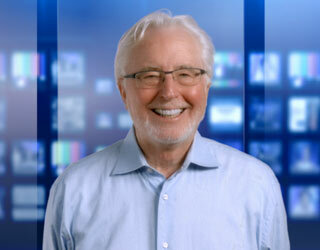 We carry several professional teleprompter brands including Autocue, Telescript and Prompter People. The unit sits on your tripod and then your camera sits on the sliding 15mm rods of our prompter plate. The talent looks right into the lens to read the copy. It is suggested you show the “Ten Top Teleprompter Tips” (video located in the footer below) to your talent as much in advance of your shoot as time will allow Many producers have asked for this and, after showing it to their talent, informed us that it gave the talent more confidence and made the shoot go much more smoothly and resulted in a much more natural reading. The average set up time is only about twenty minutes. The copy can be sent to the operator (in Word format) in advance or given at the shoot. 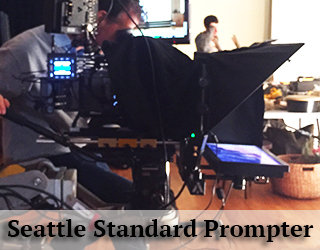 Adjustments and edits to the text can be made on set. Prompters are delivered at no charge within the city but there is a mileage charge of .56 cents/mile plus any tolls. This two unit set up allows a director/interviewer and talent/interviewee to have a “face-to-face” conversation with each other, while achieving the effect that they are looking into the camera. This technique allows talent to relax and have a more natural conversation looking at a face rather than the dark abyss of a camera lens. 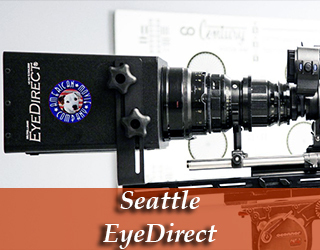 The EyeDirect functions like the Interrotron Mark III in that both talent and director are able to see each other “face to face” and can judge body language as well as speech while allowing the talent to maintain perfect eye contact with the lens. 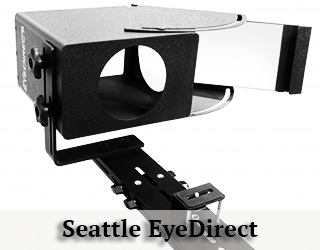 To learn more about the EyeDirect just click on the tab in the top menu. The unit comes in a custom-fitted Pelican case which protects it while being shipped. The case weighs 30 lbs and is just a bit larger than the typical airline carry-on bag. This unit is comprised of two glass panels on thin steel rods which are positioned on either side of a podium. The audience can see right through the clear glass so the speaker’s face is not blocked from view. He/she can clearly see the text reflected in the two-way mirror glass from their vantage point behind the podium. 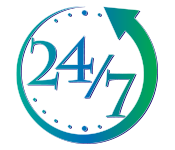 In the case of live events, it is advisable that the operator arrive an hour or two before the show to rehearse with the talent. Time can be used to adjust the font and size of the text and to make any other changes. What is important is that the speaker is comfortable when reading the copy in front of an audience. All operators come with a backup laptop. 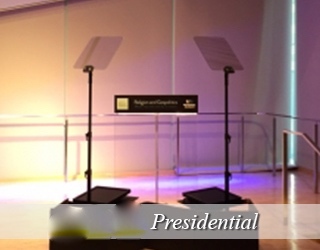 For more information as well as images of the Presidential Prompter click on the tab at the top menu. For more information on this unit, click here. For larger monitors and unique set ups, please call Bill at 917.414.5489. 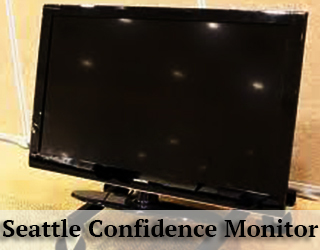 The confidence monitor is recommended for live events in which the speaker walks around the stage and/or does not stand at a podium. These units can be set up in several different ways. The first option is placing them down stage. This is ideal for elevated stages, where the speaker generally has to look down when addressing the audience. The second option is to have the monitor on a stand positioned side or off stage – achieving a similar effect as a down stage monitor. The third option is a “back of the house” set up, in which, as the name suggests, a large monitor is placed at the back of the room behind the audience. This way, the speaker looks out towards the audience and delivers his/her speech. Price: $95 without iPad; $120 with iPad (call 917.414.5489 for extended rental packages). Stand not included. 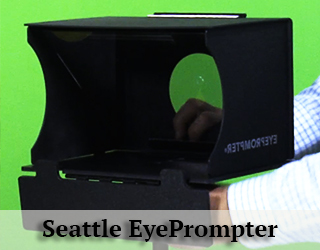 The EyePrompt is a small, compact and practical unit ideal for low budget shoots. It is important to not, however, that many iPad prompter softwares do not allow live scroll speed adjustments, which means talent must keep up with the speed of the script, rather than an operator following a talent’s natural pace of speech. To get more info on this device, please click here. 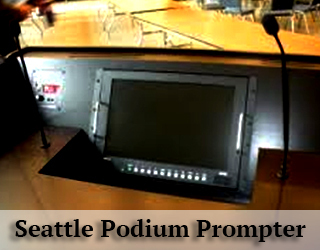 The Podium Prompter is an alternative to a presidential prompter set up. It is a thin teleprompter monitor placed on top of the podium out of sight of the audience. The cable is dressed down the inside of the podium and out to the operator off stage. The speaker just glances down at the top of the podium as if glancing at notes and then returns his/her gaze to the audience. This is the most “invisible” of the prompter types for a live performance. This unit is not available in all locations and is custom built. Please call Bill 9170414-5489 for more information re availability and pricing. Logging was Seattle’s first major industry, but by the late-19th century, the city had become a commercial and shipbuilding center as a gateway to Alaska during the Klondike Gold Rush. Growth after World War IIwas partially due to the local Boeing company, which established Seattle as a center for aircraft manufacturing. The Seattle area developed as a technology center beginning in the 1980s, with companies like Microsoft becoming established in the region. In 1994, Internet retailer Amazon was founded in Seattle. The stream of new software, biotechnology, and Internet companies led to an economic revival, which increased the city’s population by almost 50,000 between 1990 and 2000. 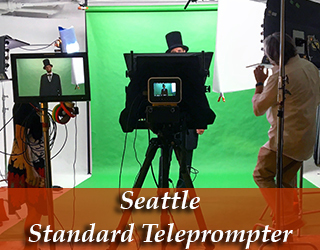 Seattle Total Prompter Service provides experienced, professionals who will deliver and operate: Teleprompters, Presidential Teleprompters, Confidence Monitors, Interrotrons, EyeDirects and iPad Prompters / EyePrompts. Seattle has a noteworthy musical history. From 1918 to 1951, nearly two dozen jazz nightclubs existed along Jackson Street, from the current Chinatown/ International District, to the Central District. The jazz scene developed the early careers of Ray Charles, Quincy Jones, Ernestine Anderson, and others. Seattle is also the birthplace of rock musician Jimi Hendrix, origin of the bands Nirvana, Pearl Jam, Soundgarden, Alice in Chains and the alternative rock movement grunge. 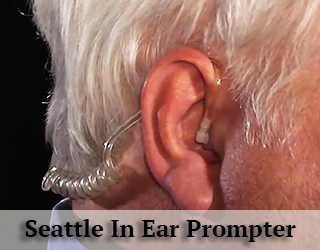 I am a teleprompter operator here in Seattle and love it. I meet such interesting people in all areas. Sometimes they’re famous other times they’re wealthy types and still at other times they are folks just like us. Last month I went to a wedding in Hoboken, yes! New Jersey! It was a fabulous experience. 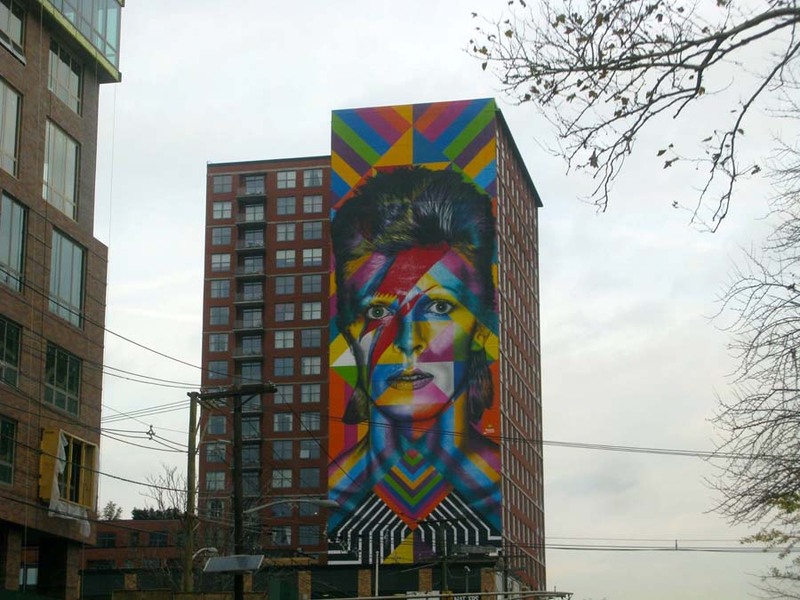 Upon entering the city I gazed up and saw this depiction of one of my favorites – Bowie! Just had to share it with you. 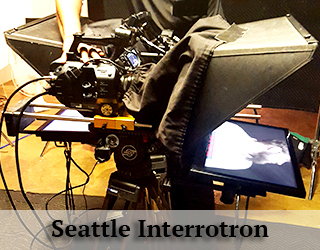 We supply Teleprompters, Presidential Prompters, Podium Prompters and Confidence Monitors to most event venues in the Seattle area. 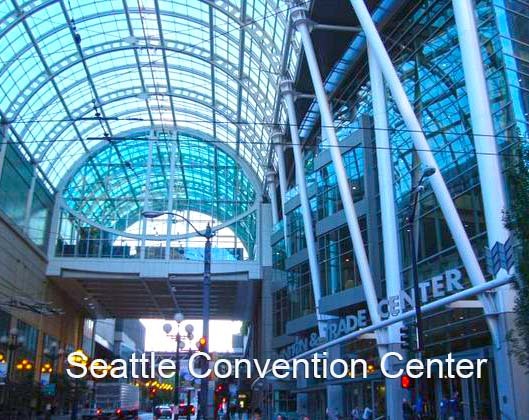 The Washington State Convention Center is the premier event space, boasting 61 conference/meeting rooms, 4 ballrooms, 6 exhibit areas and plenty of additional seating areas.